If you have any questions about the DOPAMINE information page below please contact us. 35-metre superyacht DOPAMINE comes from Chinese shipyard Heysea and features a beautiful white hull and superstructure with the sturdy modern styling of a Heysea Atlantic 115 model. 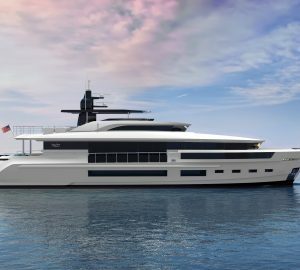 With a summer launch set in 2019, her naval architecture comes from Azure Naval Architects, while exterior styling is from Unielle Yacht Design and interiors by H2 Yacht Design. The accommodation sleeps up to 12 guests across five en-suite cabins, while the crew of five make use of her efficient layout for quick and discreet service. The lower deck transom door lowers to provide a spacious swim platform with steps down into the sea. Steps lead up to the main deck aft, where there are an aft-facing sunbed and a forward-facing sofa with two alfresco dining tables for casual outdoor dining. The foredeck offers guests in the Master suite a private outdoor retreat furnished with a forward-facing loveseat and drinks table along with a double sunbed on the bow and benches along the gunwales. On the flybridge, guests are treated to sun loungers along the aft with a skylight to illuminate the main deck aft below. 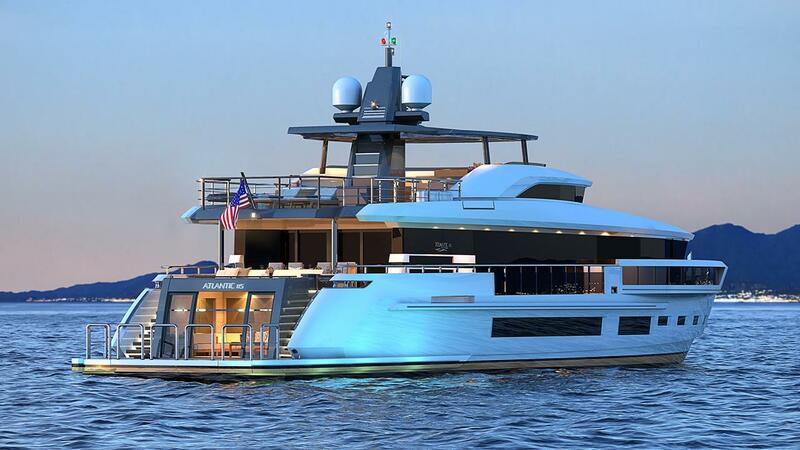 An infinity Jacuzzi is placed along the port side and forward, the hardtop shades a C-shaped alfresco dining area. Opposite, the wet bar has an excellent selection of drinks for any occasion, day or night. The lower deck aft opens into a beautiful modern beach club, within which there is a large aft-facing sofa and a love seat with a coffee table, and a widescreen TV placed upon the starboard wall. Forward of the engine room is the majority of the guest accommodation followed by the crew accommodation, mess, and laundry facilities. On the main deck, the Master suite is placed forward with the galley and main foyer behind. In the open-plan salon, a bar is placed forward and to port in front of the formal dining area, which seats 10 guests close to the starboard glass sliding doors out onto the walkway. To the aft, there is a C-shaped sofa with a coffee table, ad a widescreen TV on the opposite wall for entertainment. Up in the pilothouse, there is an L-shaped sofa with a raised table behind the helm station, while a skylight provides even greater natural illumination. A door to the aft leads to the flybridge, where there are an outer helm station and more guest amenities. Twin Caterpillar C32-1925 HP engines give superyacht DOPAMINE a maximum speed of 23 knots. The accommodation sleeps a maximum of 12 guests over 5 en-suite cabins: 1 Master suite, 2 VIP staterooms, 1 double cabin and 1 twin cabin. The Master suite is located on the main deck forward and contains a massive wardrobe and a lounge area to both sides of the bed along with glass sliding doors out onto the foredeck. A widescreen TV pops out of the forward cabinetry beside the desk, while forward windows and a skylight extending the length of the room ensure plenty of natural light and excellent views. The en-suite bathroom is placed behind the bedroom and provides his-and-hers sinks and a spacious shower. On the lower deck two VIP staterooms are placed aft to port and starboard and contains a desk, large wardrobe, a widescreen TV and a bathroom with a generous shower. Forward of the VIP staterooms is a twin guest cabin to port and a double cabin to starboard, both of which have a widescreen TV and an en-suite bathroom with the same amenities as the VIP stateroom. We do have available further amenity, owner and price information for the 35m (115') yacht DOPAMINE, so please enquire for more information. The luxury yacht DOPAMINE displayed on this page is merely informational and she is not necessarily available for yacht charter or for sale, nor is she represented or marketed in anyway by CharterWorld. This web page and the superyacht information contained herein is not contractual. All yacht specifications and informations are displayed in good faith but CharterWorld does not warrant or assume any legal liability or responsibility for the current accuracy, completeness, validity, or usefulness of any superyacht information and/or images displayed. All boat information is subject to change without prior notice and may not be current.